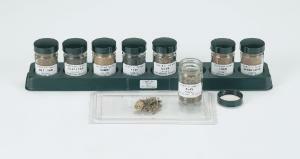 Eight soil samples: silt loam, clay loam, sandy, peat, muck, clay, loam, and sandy loam. All come in clear glass jars with screw tops. These soil samples are excellent for weathering and erosion, soil structure and formation, and porosity and permeability Earth science labs. Samples allow students to become familiar with the apperance and "feel" of these important soil classes. Each sample has been carefully selected for its uniform size and quality. Sample jars fit neatly in plastic tray.